Both of our baby dinosaur friends are growing up. The Pokemon Company had already revealed several of the new Pokemon to X and Y on the official website, including the two fossil Pokemon, Tyrunt and Amaura. In an update today, the company showed the evolved forms of both Pokemon. Tyrantrum, evolved from Tyrunt, was a powerful Pokemon 100 million years ago -- it's even characterized as a Despot Pokemon -- and has a powerful jaw. Both Tyrunt and Tyrantrum have the ability Strong Jaw, which strengthens biting moves like crunch. 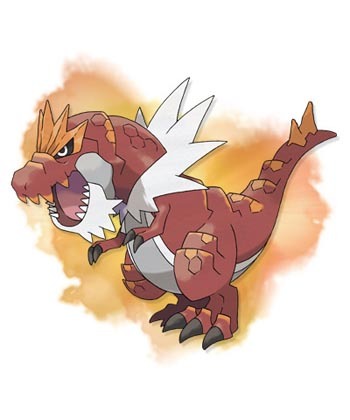 Like its previous form, Tyrantrum is a rock/dragon-type Pokemon. It also knows the move Head Smash, which is a powerful rock-type move with some recoil. Amaura evolves into Aurorus, the tundra Pokemon. The rock/ice-type Pokemon knows Refrigerate, which causes normal-type moves used by the Pokemon to become ice-type. Aurorus can learn Freeze-Dry, a new ice move that can freeze the opponent. Freeze-Dry is super effective on water Pokemon, which are typically resistant to ice-type moves. Like always, as a trainer you can only pick one of the fossil Pokemon. The official Pokemon X and Y site also includes information on many other new Pokemon. Furfrou, the poodle Pokemon, can have its appearance changed by grooming it. Meowstic is a psychic Pokemon with two different forms depending on its gender. Male Meowstic provide support while female Meowstic are more physically aggressive. Modeled off of lions, the little Litleo evolves into Pyroar, who grows a mane if male. Skiddo and Gogoat can carry trainers on their backs. These are only a few of the many new Pokemon coming to X and Y, and the PokeDex is only going to keep growing.